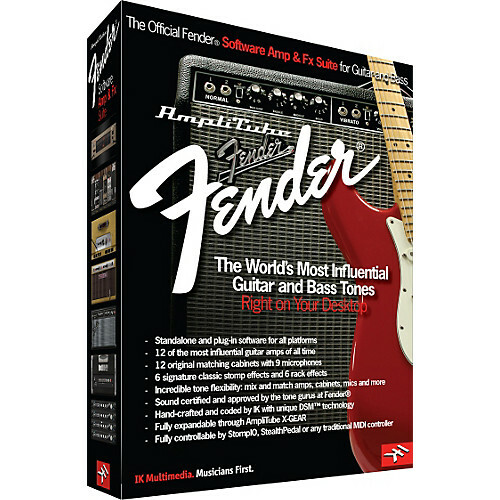 AmpliTube Fender, Software Amp Simulator from IK Multimedia in the Amplitube series. 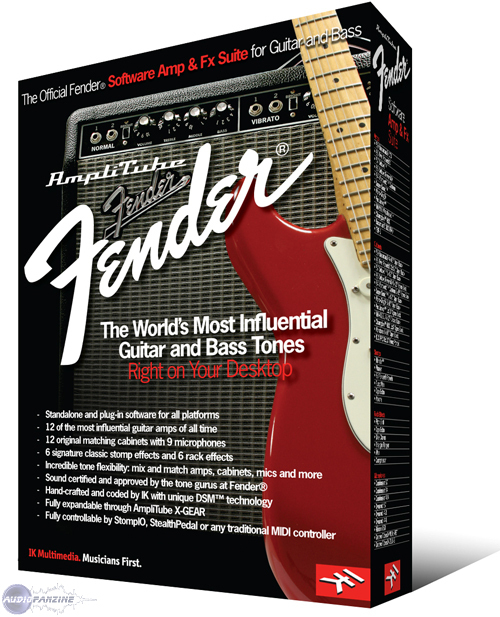 tarrtime's review"Expansive Collection of Modeled Fender Amps"
Amplitube Fender is an expansion pack for IK Multimedia Amplitube. With the introduction of Amplitube Custom Shop, individual amp models in this package can be purchased separately rather than as a bundle. 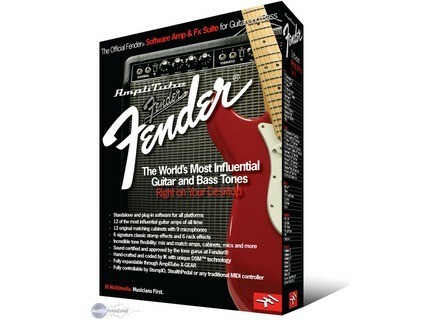 The range of Fender amplifier simulations goes beyond anything else available on the market. I love the sound of the 'small' Fender amps in this bundle (Deluxe, Pro Junior, Champ). The mid-sized amps (Twin, Deluxe Reverb, Vibro-King, Vibroverb) are the best parts of the bundle. I consider these kind of amps to be the quintessential Fender amp sound. If you want modeled versions of this kind of amp sound, this package is the way to go. Don't bother with - Guitar Rig 5, OverLoud THD, Pod Farm 2, Eleven. I consider the Fender Bassman to be in a separate class of its own. The 4x10 cabinet simulation in AT3 for the Bassman is the best compared to all the other competitors. What surprised me the most about this software was the heavy-sounding amps. I don't really consider Fender to be known for amps with a lot of drive/distortion. I normally think Marshall, Mesa-Boogie, Bogner, etc. when I want overdrive. The Fender Super Sonic and Metal Head were surprisingly unique, and a nice change of pace compared to other types of these amps. The Metal Head is definitely extreme gain, but has a unique voicing compared Mesa-Boogie and Bogner. The Super Sonic can cover a full range of amp sounds from clean - extreme. I like this amp best for the mid-gain settings comparable to Marshall, Matchless, etc. Fender Amps are some of the most popular and most recorded amps from the past 50 years. I'm glad Fender decided to go ahead and have an entire range of their amps modeled rather than just the Twin and 4x10 Bassman that are staples of every amp software. It is a lot of fun to play through these amp sims because their sound is so familiar. I typically play rock music, so I usually want the sound of a Marshall or Mesa-Boogie with a little bit more gain than a Fender Twin. However, I will always have a soft-spot for the Fender clean amp sound because my uncle gave me a '72 Silverface Bassman 100 when I first start playing guitar. With amp sim software, it is so cheap to get so many different amp sounds. 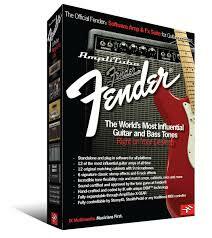 To me, these Fender amp sounds are essential to any producers/engineers collection. 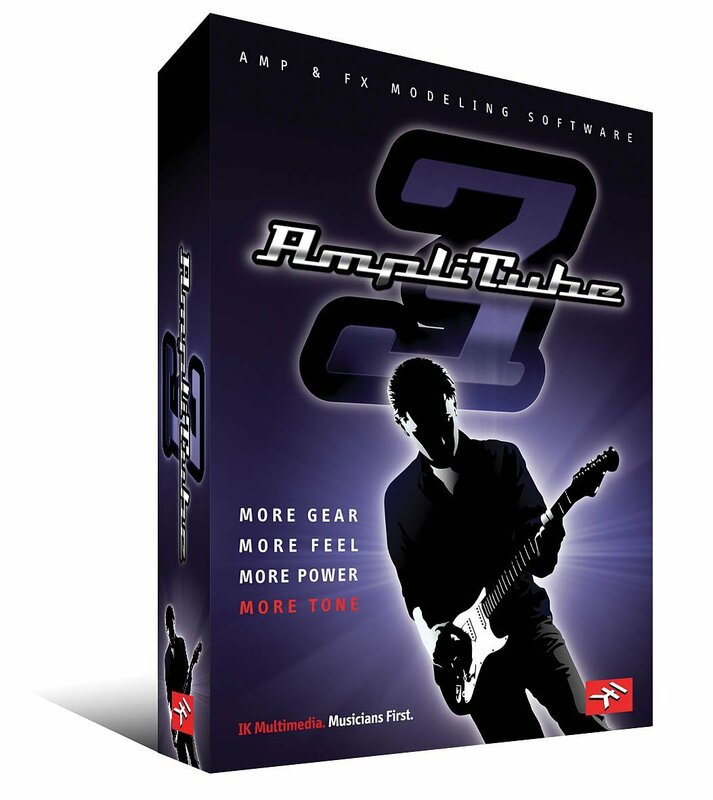 Wedges2's review"Gotta be one of the best amp simulators"
Getting started is a breeze. Pop the disc in, install it, and authorize it, run it. It's just an effect after all. It's a very simple plugin too. You have a lot of options but they are all very easy to understand. The hardest parameters are probably the ones reguarding the individual effects, like compression, if you don't have experience with it. 4 screens: effects, amp, mic, racks. All very intuitive if you're a guitarist. Still easy if your not. It is one of my more CPU intensive effects. Not that it's that bad but it will take up more than an EQ or reverb. I run a Gateway 2.0GHz dual core, 2GB RAM computer. I've been using it for over a year. It is a stable plugin. Never had problems with it crashing. Works fine on Windows XP. It is really as good as you make it. By that I mean you need a good guitar sound running through it to really get a good tone. It's got everything you need to make a good guitar but you just got to work with the effects, pedals, mics, amps, etc to get what your looking for. To help out they have a ton of presets which are usually what I use and then make simple tweaks to them. I don't think it's as good as a live guitar if your running a guitar vst through it but it's a close second. RealStrat + Amplitube Fender beats out G1 Electric Strum any day. I'd definatly make the choice to buy it again. 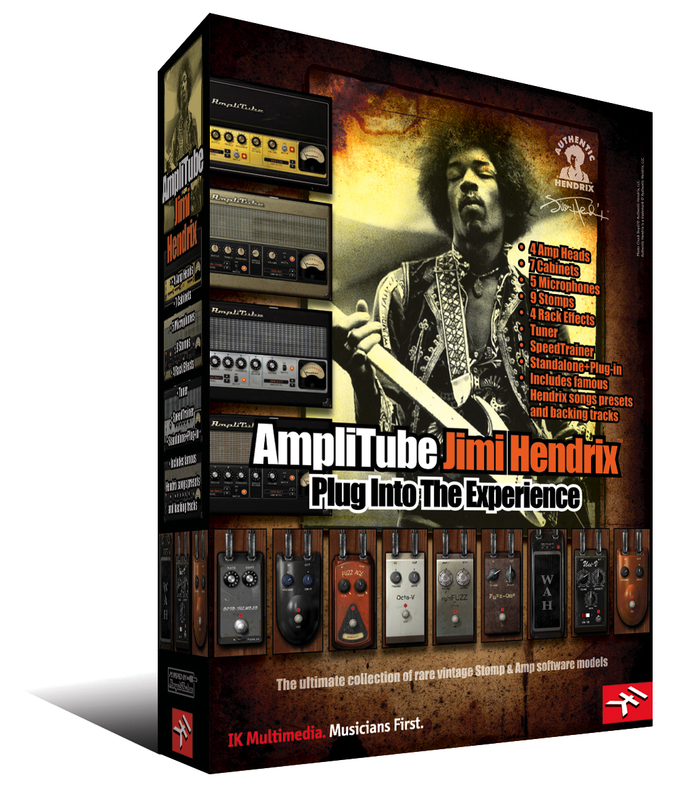 I would take a look at all of the Amplitube plugins and find the one that is right for you. I've only tried Fender but I'm sure they are all quality products. For me this is a joke, if you want to work unusable seriously! I plug my TV in my Fireface 800, put the plug on my track and I the worst guitar sound I've ever heard. I have long worked with a Pod XT and it is far better, even incomparable. But then I found this one shabby. I have a friend who has it and it is of the same opinion. I have a max of breath, the sound is loud, I recognize not my guitar, which is a wonderful TV custom shop, malgrès settings testing the sound is really rotten. I recommend to potential buyers of this horror rather buy a pod farm amp or so I have not tested but should be much better than the "product" of which we speak here. That I do not lose more time to decry this lousy plugin Ik multimedia. slayd1's review (This content has been automatically translated from French)" Mixed feelings ..."
IK Multimedia and Fender Musical Instruments Corporation announced the release of AmpliTube Fender version 1.1, a free downloadable update for all registered users of AmpliTube Fender.